Adorable Wedding Concepts has beautiful white hand held wedding umbrellas available for all occasions. The umbrellas are pure white and suitable for both wet and hot days. They come with a matching elegant white stand which will be placed near the walk way to the garden wedding setting where they are easily accessed by your guests. They are perfect if the weather is looking unsavory, even on those especially hot summer days when there may not be much shade. The umbrellas are an essential item for any outdoor wedding ceremony and are an additional extra in our Princess, Romance and Eternity packages. 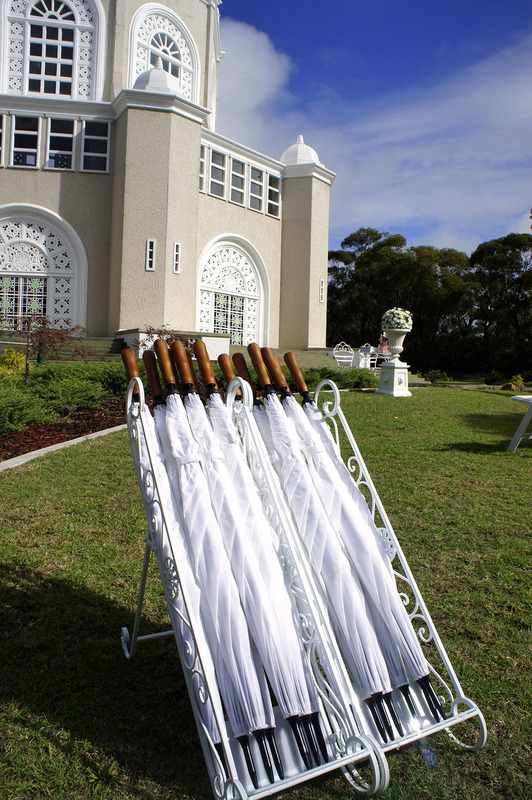 The white umbrellas will be supplied in lots of 20 with a total of 40 available and are only available as an addition to your wedding ceremony package.